This guide provides information on how to use the tools, features and capabilities that have made Enterprise Architect the tool of choice for Enterprise, Business, System, Standards and Technology modeling worldwide. You will learn how to harness the power of Enterprise Architect to simplify the way you work, unify interdisciplinary teams, create models that perform work, leverage and reuse assets across programs and projects and much more. Product Information - in which project managers and other stakeholders can read about the Licensing Model, available Editions, Support options and more. Many readers might want to read through a number of pages in a section of the guide to gain a deeper understanding of a topic. The way to navigate is to use the Hamburger (Contents) button to view and select a particular topic or sub-topic. In addition the breadcrumb menu can be used to navigate backwards though the hierarchy of a topic. This effectively allows you to trace your footsteps and return to the sections you have previously traversed. Think of it as being like climbing a tree where you reach a point and need to return to where a limb branched off in order to follow a different path. The guide can also be navigated using the Previous button and Next button, which allow you to move through the stack of recently opened pages. The tool provides a powerful search facility that allows topics, sections and pages to be found easily. 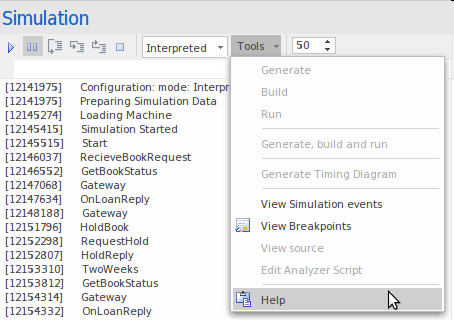 In this example a user is searching for how the tool can be used for simulations. They enter the keyword 'Simulation' and the guide responds with a list of available information not just from the guide, but from the Website, Video Library, FAQs and the Forum. The tool also provides an Advanced Search feature which allows a user flexibility to search conditionally using logical OR and AND including a Phrase search and the facility to specify which sources to use for the results. 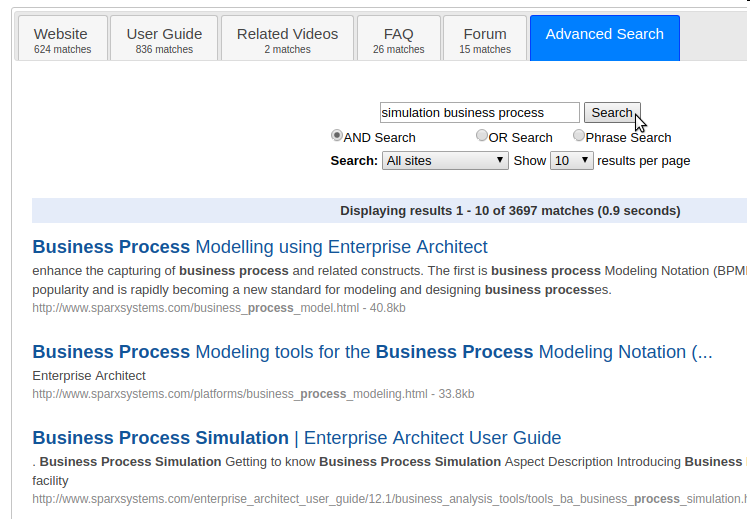 In this example a user is wanting information about Simulation in the context of a Business Process and so uses the AND option to search for results. 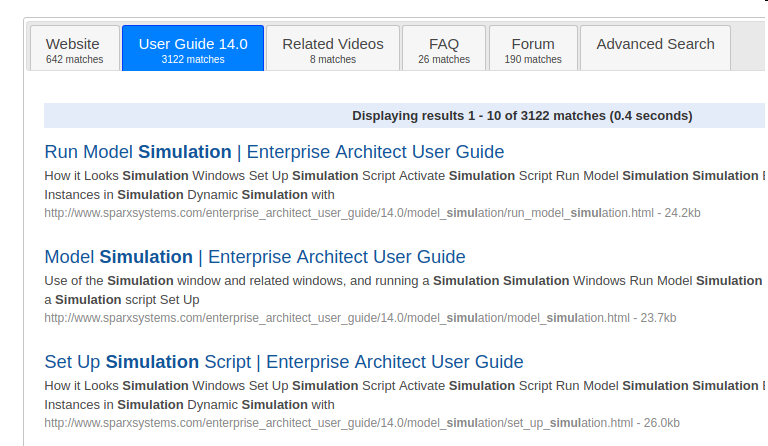 One of the most common ways to access the User Guide is to follow links to it from the Enterprise Architect user interface. The links from the tool will provide a contextually appropriate page that will assist you with the part of the tool that is being used. Sparx Systems likes to stay in touch with what Enterprise Architect users require to accomplish their tasks efficiently and effectively. We value any suggestions, feedback and comments you might have regarding this product, documentation or install process.